If you put your mind to it and have good discipline, you can always improve the situation for yourself and the ones around you. This is one such story. 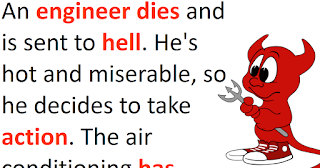 An engineer dies and is sent to hell. He’s hot and miserable, so he decides to take action. The air conditioning has been busted for a long time, so he fixes it. Things cool down quickly, and Hell gets a little more enjoyable for everyone. Walking around one day, the engineer notices that the moving walkway motor has jammed, so he unjams it. People can now get from place to place more easily. One day, God decides to look down on Hell to see how his grand design is working out, and notices that everyone down there is happy and enjoying umbrella drinks.